I’ve been venturing outside of my cooking comfort zone lately and trying more refined dishes. I guess watching so many Masterchef episodes has really inspired me to be more adventurous. 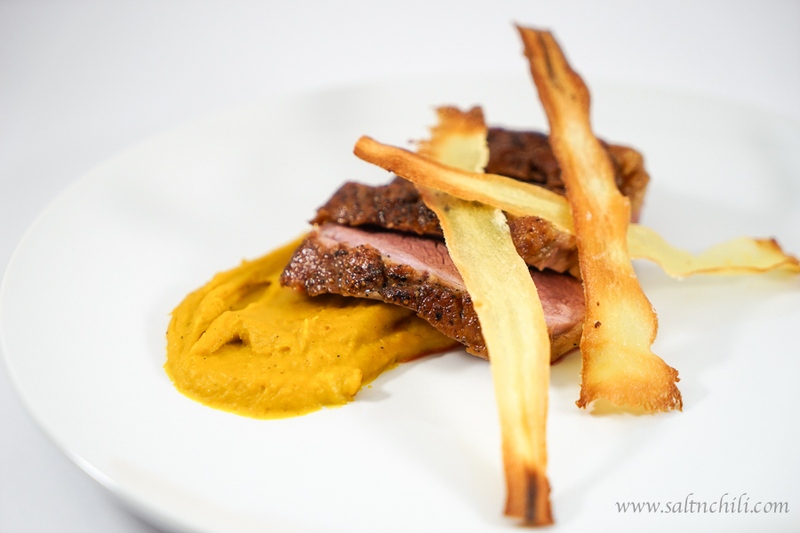 The other night I tried a pan-seared duck breast with a pumpkin purée and parsnip crisps and it turned out better than I expected. 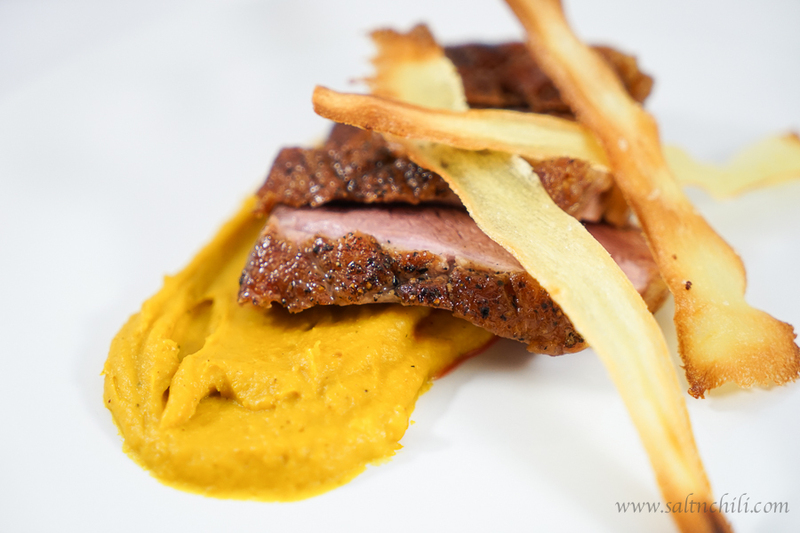 The duck was a tad bit under and my pumpkin puree was sweeter than I intended, but overall I think I did a good job. At least hubby didn’t complain and said it was a good effort. Ideally you want your duck breasts to have a crispy skin and a pink centre. Since the size of the meat varies and the temperature of everyone’s cooker is different, there isn’t an exact recipe you can follow to achieve the perfect duck breast. There are guidelines you can follow and with some practice it is achievable. I watched Gordon Ramsay’s video to get me started and found this link to be useful as well. Pat duck breasts dry with paper towels. Score the duck breast (1/4″ apart) in a criss-cross. Rub with salt and pepper. Place the duck breast skin-side down into a cold pan, than turn on the heat to medium-low. Render the fat for 8-12 minutes, the skin will crisp up and be golden brown. Turn the duck breast over and cook for another 1-2 minutes. Then transfer the duck to the oven, skin-side down and cook for 4-6 minutes. Take the duck breasts out and allow to rest for at least 5 minutes. The slice on an angle to serve. Cut the pumpkin into 1 1/2″ chunks. Place the pumpkin on a tray lined with baking paper. Drizzle with olive oil and season with salt and pepper. Roast for 20 minutes in the oven until soft. Transfer to a colander to allow any excess liquids to drain. Bring the cream to a boil over medium heat, and allow to reduce by a 1/4. Then purée the pumpkin and cream with a stick blender or food processor and pass through a fine sieve. Season to taste. Using a peeler, peel long strips from the parsnip (discard the outer peel). Place the strips in a bowl with the oil and toss well. Arrange the parsnip strips in a single layer on a baking tray and roast in the oven for 20 minutes and turn halfway. They are ready when they are golden. Remove from the oven and immediately season with salt.